>> Scenario-1: No input validation is implemented. 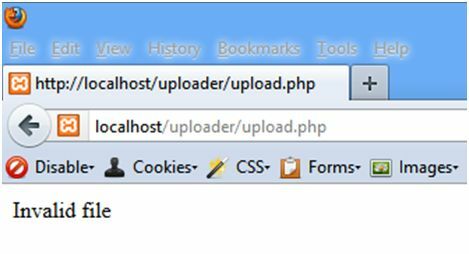 The attacker accesses the file upload page, clicks on browse and selects a PHP shell file and clicks on upload. The file is uploaded successfully. Now the attacker accesses the shell file from URL and downloads the source code of the application. Lesson: Input validation is a must and as we know that client side validation is as good as no validation and can easily be bypassed through any client side proxy tool. Therefore server side validation should be implemented. >> Scenario-2: A server side validation on file extension is implemented. 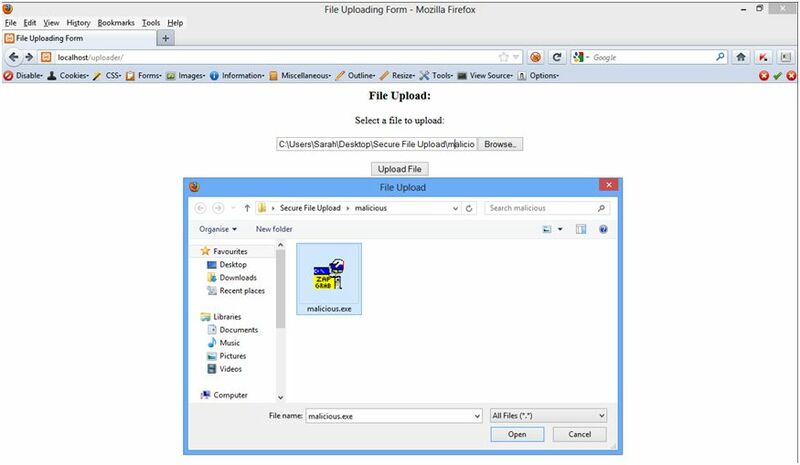 An attacker accesses the file upload page, clicks on browse and selects an exe file to upload. He clicks on upload and an error message is shown to the attacker. Now he again clicks on browse, selects the same exe file and captures the http request in burp proxy. He changes the file extension to jpg from exe and forwards the request to server. This time the file is uploaded successfully. Lesson: Validating file extension is not sufficient to prevent malicious file upload. >> Scenario-3: A server side validation on extension & content-type is implemented. content-type is an HTTP header which contains the content type of a file, for example – if a file is jpg, the content-type header will show ‘image/jpg’ which means it is an image file with extension jpg. An attacker accesses the file upload page and clicks on browse. 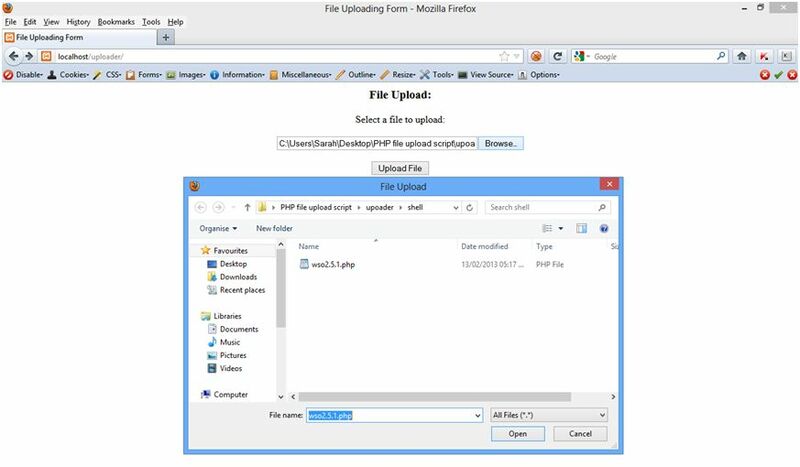 He clicks on upload and captures the request in burp. He manipulates the extension to jpg and forwards the request. An error message is displayed to the attacker. Now the attacker repeats the same process but this time he changes the values of file extension to jpg as well as content-type to image/jpg from ‘application data/octet-stream’. He forwards the request and the malicious file is uploaded successfully. Lesson: The file extension and content-type values can be manipulated; therefore even a combination of these is not sufficient. >> Scenario-4: A server side validation on file extension, content-type and actual content of the file is implemented. Each scripting language has in-built functions to read the content of the file and derive the content-type out of it. This type of functions might be useful to prevent malicious file upload. An attacker accesses the file upload page and clicks on browse. He clicks on upload and captures the request in burp. He manipulates the extension to jpg & content-type to image/jpg and forwards the request. Still an error message is displayed to the attacker. It confirms that if the content of file is validated and content-type is derived from the content an attacker cannot bypass it. A sample image file upload code in PHP is given below. Make sure that you go through the comments also to understand the functions. Note: Enable ‘php_fileinfo.dll’ extension in php.ini file before executing the code. To enable an extension remove ‘;’ before it. /* change the filename with a customized filename. However there are various methods through which an attacker can attach a malicious code in an image file and upload it to the server. Normally content validating function checks starting 10-15 lines of the content due to performance issues like speed of upload and resource utilization etc. Implement strict server side validation on content of the file. Additionally file extension and content-type can also be validated. Create a customized file name before storing it to a permanent storage in file system. For example – append system time (time()) and hostname of the user (gethostbyaddr($_SERVER[REMOTE_ADDR])). 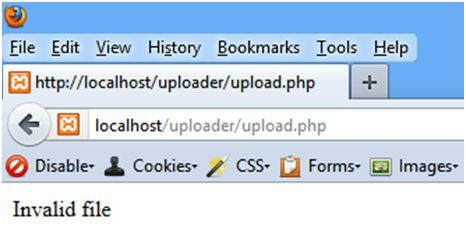 Refer upload.php code to understand the function. Do not store the file in document root. 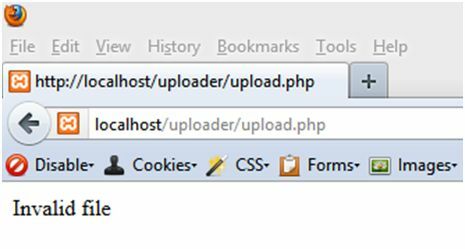 If document root is C:/xampp/htdocs/uploader then create a directory C:/xampp/htdocs/uploads and use it to store uploaded files. This way the attacker cannot retrieve the source files directly. Implement strict server side validation on file size. Apply server side restrictions to remove EXECUTE permission from the uploaded files and upload folder. Limit number of file uploads or implement CAPTCHA to prevent DoS attack. Disable directory listing in the web server. Storing files is database is a better approach than storing in file system. It does not allow users to execute files directly from the URL as it is not stored in a directory. The key point is to validate the content of the file before storing it to database. A sample image file upload code in PHP is given below. Though file upload with the help of database is more secure than in file system, server side validation of file content is the most important control to prevent malicious file upload. This entry was tagged Application Security, Malicious File Upload, OWASP, PHP. Bookmark the permalink. It will be good if u can provide source code for each type separately.And I guess there is some problem in code also as I am unable to execute it. It should work because I have tested it in my system. Don’t forget to enable php_fileinfo() extension before executing the code. Refer my post.